50 transparent sleeves per package. Fits Cards of This Size: 63 x 88 MM. Sleeves Size: 66 x 91 MM. Example games: AGOT, MTG, 12 Realms, The Cohort, Ashes Rise of the Phoenixborn, Android Netrunner, Lord of the Rings and more. If you have a game and you do not know what sleeves you must use, feel free to download our excel file HERE. In the file you will find over 5000 game entries and the corresponded sleeves you will need. If you have further questions do not hesitate to contact us at magecompanyinfo@gmail.com. Min. order value $10. 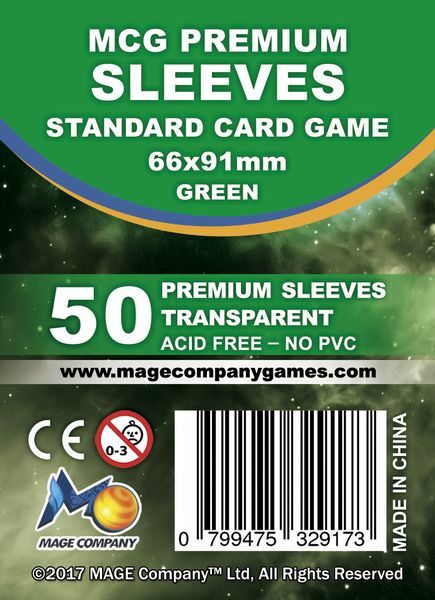 Beside the Standard Card Game Sleeves, we expand our sleeves line by producing additional sizes such as: Big Square Sleeves, Mini Euro, Standard American, Mini American Sleeves, Black Matte, Green Matte and many more. MAGE Company is producing premium card sleeves since 2013 by adding new sizes to standard sleeves line such as the mini square sleeves for kingdom death, the king square sleeves for 7th continent and more. We focus on providing card sleeves of excellent quality and endurance for casual and card gamers. Our target is to offer the largest collection of standard and non-standard sleeves sizes in the premium category. Due to technical reasons and updates on our website, our automated payment system via paypal is not working. Until we complete all new changes, any order can be completed via bank transfer. When you select the items you want, press checkout and a message will appear with the info to send payment. You can send your address and order at this email address: magecompanyinfo@gmai.com. Min. order value is $10. We are shipping out our sleeves from our offices in Athens, Greece. For EU countries it takes around 5 business days for delivery. Exceptions are Nordic countries, UK, Spain, where it takes around 7 business days. For US, Canada and Russia it takes around 10 business days for delivery. For Latin America, Brazil, Asia, Australia, New Zealand, Singapore, Israel it takes around 12 business days for delivery. We use ELTA, the Greek post offices for dispatching our orders. Any parcel over 2kg gets tracking number from the post office. Any parcel below 2kg does not get tracking number based on the post office’s system. When a package is dispatched, a message is sent by MAGE Company to each customer to inform about the dispatched orders. Due to the big volume of orders, we dispatch the orders in groups. We release 3-4 groups in monthly basis.